I love small coastal villages and those especially on the north coast of Scotland inbetween Inverness and Fraserburgh. My favorite spot in particular is the lovely villages of Cullen, Portknockie and Findochty. We quite often hire a cottage for a week in Portknockie and just relax, explore and unwind in this heavenly area of northeast Scotland where we always feel like part of the villages themselves. The total population of all 3 villages is around 3800 which is just perfect for me and here you will find the real Scotland. These villages are full of character but they are not dressed up for tourists and do nothing in particular to cater to them as they are delightful all on their own! Findochty is a true fisherman's village as it is centered on the harbour and sprinkled with an abundance of fisherman's cottages all jostling for position. In the early 1400's the village of Findochty was crowded around the natural harbour known as Crooked Haven. It expanded as a fishing port through the 1700s and 1800s, and by 1850 was home to 140 fishing boats. The late 1800's saw the expansion of nearby Buckie and by the middle of the 1900's most of the fleet was operating from Buckie instead. The end result, was this traditional fishing village became a haven for lesiure sailors and one of the prettiest villages I have ever been in! Portknockie is inbetween Findochty and Cullen. While Findochty is built around the harbour Portknockie differs in that it lies above on the cliffs. These spectacular cliffs drop dramatically to the shore below. Portknockie's harbour is naturally sheltered by the rocky bluff of Green Castle which was once a Pictish stronghold. With a history going back to 1677, most of the village stands above the harbour is predominatly the smaller fishermen's cottages. Here you will also see the larger captains houses that came about in the propserity of the late 1800's. No pretension here, as Portknockie is very much a residentail community that does not have to rely on tourism to survive but has en easy charm that captivates. If you walk along the clifftop path that leads around from above the harbour you will find Bow Fiddle Rock. The rock is a wave-cut natural arch which provides a dramatic roosting place for gulls and cormorants. Further on in the walk you get some great views over Cullen Bay to Cullen. You can either walk along the beach or along the cliff which wanders beside Cullen Golf Club. This is a traditional links course which has amazing views over the Moray Firth and if you are lucky, you may see a dolphin or two! Cullen is a very attractive town built around the Burn of Deskford. I love to wander around the Seatown area where all of the cottages have a wonderful patchwork look. The render between the stones is a differing color of the stones themselves and the effect is quite lovely. Cullen was established in 1189 and has a church that was built in 1236. Its wealth in the 1700s was built on textiles, and threadmaking in particular. The village really came into its own with the herring boom of the early 1800's. Cullen is well known for the traditional Scottish dish "Cullen Skink". This is a chowder like soup of smoked haddock, potatoes and onions. "Skink" merely comes from the Gaelic word for "essence". If for nothing else, come for the ice cream, as the shop in town is regarded by many as the best in Scotland! This area is home to some amazing fish and chips shops that you will find as you wander through these beautiful villages. The local pubs are also a great place for a good meal and catching up with the locals. The best gossip in town can be found of course at wee shops in each village and you will find no lovelier coastline anywhere! 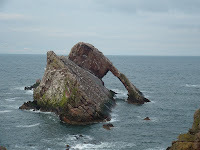 Picture of Bow Fiddle Rock, Portknockie.